Soveplass til 8. 4 soverom. 2 bad. Dette er en velholdt eiendom i området Miramar Golf, Los Dolses innen gangavstand fra alle fasiliteter, lokale barer og restauranter og kjøpesenteret La Zenia. Denne eiendommen er godt møblert og komfortabel og består av en stue / spisestue og et fullt utstyrt kjøkken. Salongen har en takvifte. Nedenunder er det 2 soverom og 1 bad, oppe er det også 2 soverom og dusjrom (alle soverommene har air condition). Begge soverommene fører opp mot solterrassen mot sør. Eiendommen ligger 200 meter fra fellesbassenget. Det er en TV, DVD, Wii og iPod docking stasjon. Det er to sykler og et sett med golfkøller i skuret som også har mange nyttige ting for stranden. Denne eiendommen er ideell for ferieleiligheter. Ta en titt du vil finne denne eiendommen svært gunstig og godt plassert. Dette er en røykfri eiendom, men du kan røyke på utsiden, men bruk et askebeger. Los Dolses Plaza med supermarked barer og restauranter ligger 5 minutters gange unna. Og den velkjente Villamartin plaza ligger 15-20 minutters gange fra eiendommen. Torrevieja by er bare en 15-20 minutters kjøretur der det er mange attraksjoner, inkludert to vannparker. Aquopolis vannpark driver en gratis luftkondisjonert buss fra lokalforretningen til parken og tilbake, vennligst sjekk med dem for tider da dette varierer med sesongen. Det har også et kommersielt senter, mange nattklubber, barer og restauranter og vakre strender. Det er også et lite marked og messe hver fredag. Terra Mitica fornøyelsespark ligger i Benidorm ca 1 og en halv times kjøring. Det er også en dyrehage, et stort badeland og mange barer, restauranter og butikker. Det er også andre steder å gå til som Cabo Roig med mange barer og restauranter også det er Playa Flamenca og La Fuente. Det er 3 flotte golfbaner i nærheten, Campomor, Villamartin og Las Ramblas. Villamartin golfbane er nærmest og i gangavstand fra eiendommen. Du kan gå til La Zenia stranden i 25/30 minutter og er en 2 minutters kjøretur. Playa Flamenca og Cabo Roig strender er en 5 minutters kjøretur unna. Du er velkommen til å bruke grillen, men du må rengjøre den etterpå (eller bruk engangsbruk). Unnlatelse av å gjøre det vil medføre en £ 25. 00 fradrag fra depositumet ditt for å dekke ekstra rengjøring som kreves. Villa was tired. Not spacious enough, especially for 8 people. We arrived late evening and would have appreciated a welcome pack of some description, not even a bottle of water! Only room for 5 people to sit in the lounge area. 2 sun beds on the upper terrace, poor condition. 2 bikes, both with flat tyres. No pump! Ironing board..no cover, NO IRON! Kitchen cupboard door handles constantly coming off! Old TV set in a wardrobe, so not much clothes hanging space. Upper sun terrace really dusty. Lower terrace had a plastic patio table and 4 chairs. We were a party of 4 and found the property too small. I dread to think if 8 people rented how they would cope! For the amount of money we paid, it was extremely disappointing. We have rented about 15 times in this area and found this to be the worst. This is one we will not be returning to. Firstly, feel that the owner should advise that you have to go up a no through Road to find no 22, as there are no street names and it does not show up on sat nav. We arrived very late at night and tried phoning Ian as we couldn't find no 22, however Ian was in England and couldn't really help us. As for the condition of the house, I have today it was quite poor and also not very clean, the cooker when turned on tripped the electricity, not a very good advert for the owner being a " fully qualified electrician" as stated in the instruction manual! There were handles falling off the cupboard doors! A strip of Formica hanging off the worktop, a dodgy light fitting in the downstairs bedroom, bicycles in the shed which are held together with rust! Also both bikes had flat tyres, the upstairs sun deck was filthy and had never been brushed or had the table wiped for a very long time, and the cushions for the sun loungers were old, stained and tatty! and as for the towels and t towels they were threadbare and should of been thrown out years ago. It seems quite obvious that this house has been neglected for some time and was certainly not what we expect to find when booking through yourselves. I thought that that there was meant to be standards in place before properties are taken on for renting! To crown it all I was asked for a larger amount than quoted in the information booklet for Ian and Lynn to clean the property! What a laugh! As all they seem to do is stick the sheets and raggy towels in a washing machine! So no I would not recommend this property to any family looking for a nice, clean place to go on holiday!!! I am sorry you didn't find our home to your liking. We have never had any complaints with the directions, and these are sent out in many languages without any problem. Postcodes in our region cover a very large area so sat nav are not much use. I am sorry Ian was not there to greet you as I am sure he would have been a great help. However this is why we have a key safe and are able to be flexible with both arrival and departure times and dates. 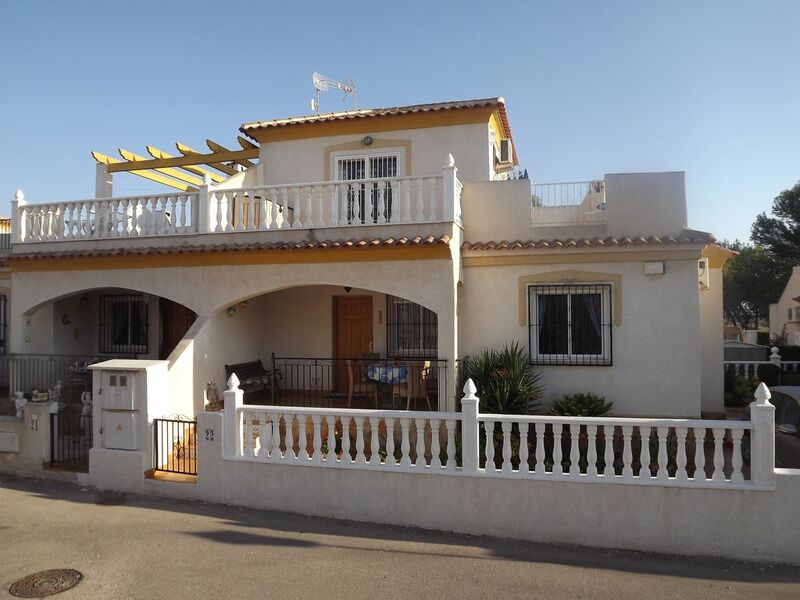 As for the electrics, the property was inspected by the Spanish electricity board in February 2017and has a pass certificate. If the oven has become faulty I will be looking at it at the end of this month along with any other electrical repairs that are required. Thank you for your feedback on the cleaning I will pass this on to Lynn who I'm sure will take it up with the cleaning contractors. The bikes are maintained by myself when my family use them approximately 3 times over the course of the year but I can't service them after each guest. The bikes are available for use at no charge and there is a pump for the tyres. Clean good towels should have been on each bed on arrival, all other towels are " for beach use ". This will be addressed if this was not the case. Replacement towels will be replenished at the satrt of the Summer season. The accomodation book was written 3 years ago and the cleaning fees have gone up since then. We no longer require guests to leave cleaning money and include it in the rental price on the booking site. The accomodation book will be updated and rewritten to make this clearer. Thank you for your comments they have been useful and we will endeavour to make improvements. 7 of us went in july/August 16, 5 adults and 2 children, everyone of us had a ball. Great location and great price, Just like a home from home, it has everything you need and more, this is our 4th time to Villa Martin but our 1st time staying at this villa, will definitely be booking again. Really enjoyable stay at this property, great location close to all amenities. Well equipped house that is obviously looked after properly. Really great price as well. Will definitely be returning next year.